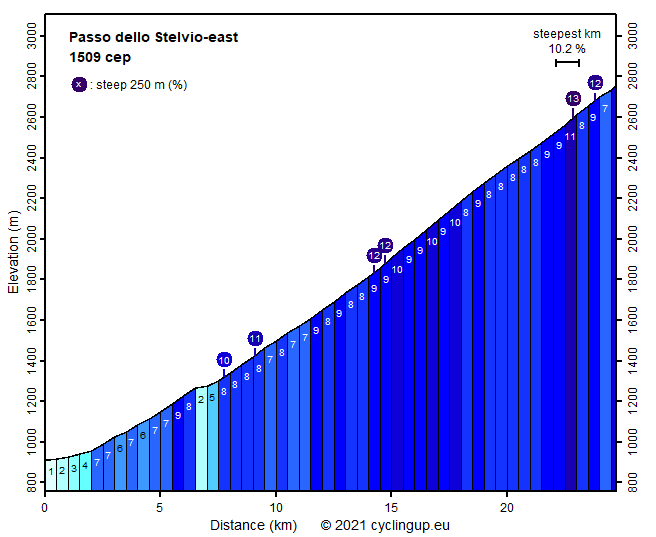 For me the east side of the Passo dello Stelvio (Stilfserjoch in German) is the world champion of all passes. Fantastic! The highest mountain pass in Italy! It is characterized by a large number of elevation meters (1849), by as many as 48, often very tight hairpin bends and by the glorious views of the snow and ice-covered peaks of the Ortler Alps. The old stone walls along the street fit well with this classic pass. What a pity that the road is also very popular among motorcyclists and car drivers. Surprisingly that street was built as long ago as in 1822-1825 by the Austrian Emperor. At that time, both sides of the pass were under Austrian rule. The first 5.5 km (maximum 7%) form a warming up. These are followed by a steeper kilometer (8-9%) shortly before Gomagoi. After Gomagoi there is the last easy section. During the remaining 18 kilometers, the slope of the 500 meter intervals measures almost always 8-9%, with only a few outliers of 7 and 10% and a single one of 11%. However, there are quite a few shorter sections (250 meter) that are steeper (up to 13%) than the local 500 meter intervals. Magnificent views of high mountains and glaciers can be enjoyed near Trafoi and in the forest, where the road winds upwards after Trafoi. Slightly above the tree line Franzenshöhe (2188 meters) is reached. From there, the rest of the ascent is visible, consisting of still 19 hairpin bends and almost 600 elevation meters. South of the road the mighty Ortler (3905 m) crowns the landscape. The pass itself is a busy place when the weather is fine in summer.